Zach Eflin admitted he was a bit jittery after Maikel Franco closed his glove on a harmless pop-fly on the left side of the infield to record the final out of Tuesday night's victory over the Braves at Citizens Bank Park. "I was out there after I threw that last pitch just shaking, thanking God for the opportunity to be out on the mound," Eflin said with a big smile. "It was awesome." The pop-out sealed a complete game and marked Eflin's first career major league win. The 22-year-old righty was economical with his pitches, tossing 65 of 92 for strikes. He didn't walk a batter and notched six strikeouts while scattering six hits. The lone blemish came on an Ender Inciarte solo shot in the seventh inning. "What an efficient job tonight," manager Pete Mackanin said. "He was just outstanding. He pounded the strike-zone with all his pitches and had everything going for him. I especially liked that last inning where he went right after them and put them away in order. He also saved our bullpen." 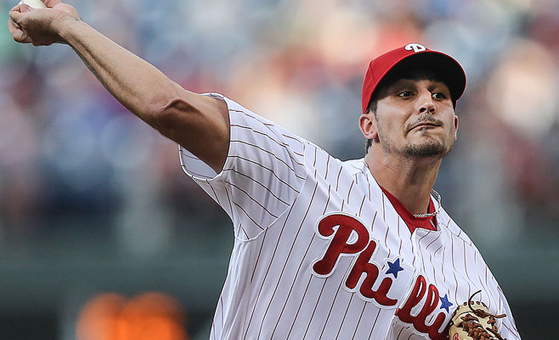 In picking up his first MLB win, Eflin became the first Phillies rookie since Vance Worley in 2011 to throw a complete game. Mike Williams in 1992 was the last Philadelphia pitcher to throw a complete game for his first major league win. Backing Eflin was an offense that erupted for four home runs en route to a 5-1 win. Cody Asche, Tommy Joseph, and Franco each homered and and finished with a pair of hits. Peter Bourjos also homered, extending his career best hit streak to 14 games. "I feel like we were all cold at the same time and now we're all hot," Bourjos said. "It makes it fun and we're putting up a lot of runs from good at-bats. We're hitting the ball hard and battling back when down in the count." Bourjos has played a major role in the emergence of the Phillies' offense, hitting a major league best .418 since the start of June. This after he hovered around .200 for the better part of the season's first two months. "I just feel a lot more comfortable and confident at the plate," Bourjos said. "I'm allowing the ball to get deeper and I'm just not over-swinging. I think that breeds confidence in the fact I'm not afraid to get to two-strikes. Before, I didn't want to get to two-strikes because I felt I was going to chase and I couldn't put myself in a good position to put a nice swing on the ball." Bourjos and the Phillies will aim for a sweep on Wednesday in the series finale before heading to Colorado for four games to close out the first half of the season. "We need to keep riding this momentum," Mackanin said, referencing the fact the Phillies have won seven of their last eight contests. "We continue this way and good things will keep happening."